Because bringing Nutelasagna -- arguably the best food mash-up of the year -- to Nick Lachey was completely unfair to everyone actually living in Manhattan, Allison Robicelli decided that the only way to make it up to us is by giving it away for FREE today. Robicelli's announced on Twitter that it will set up shop at the Renaissance Hotel in Times Square from 4-6pm -- or until they run out of the half slices. 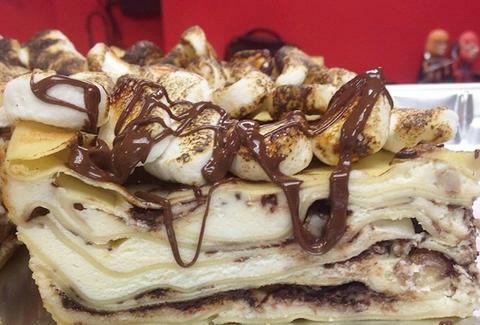 If this is anything like other dessert crazes that have taken over the city, it probably won’t take more than 20 minutes before all the Nutelasagna is gone -- so get there early, or you’ll be sorry. If you aren’t lucky enough to be one of the first 200 people to get a slice of the dinner/dessert combo, don’t fret: you can still order it by the pan here. Emily Kolars is an Editorial Assistant at Thrillist and thinks she could probably live off of Nutelasagna and wine for the rest of her life. Follow her on Twitter to see if that actually happens.